Exclusive Tryall Club Golf, Tennis and Beach Access for Silent Waters' Guests! Our Silent Waters Villa is a superb location for your family reunion, corporate retreat, destination wedding (seating 54 guests) or just a small group of friends seeking a most unusual holiday experience. Nestled in the hills of Jamaica, overlooking pristine forests and the spectacular turquoise waters of Montego Bay sits a truly remarkable private Jamaica resort property .... an enchanting heaven. 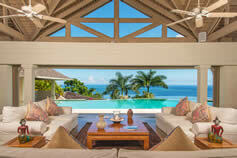 Silent Waters is a premier Caribbean luxury rental villa located in Montego Bay, Jamaica. This award-winning Jamaican holiday home is distinguished by world-class architecture, design and decor, breathtaking location, and exquisite accommodations and service. This luxury Jamaican villa rental includes the gracious staff - Property Manager, Office Assistant, Head Chef, Assistant Chef, Butler / Bartender, Housekeepers / Food Servers, Laundress, Maintenance Supervisor, Gardeners and Security Guard… 14 in all.